As each year comes to a close, we like to look back and reflect on the people we met, the journeys we went on, and the lessons we learned. In 2018, we talked to adventure travelers, authors, filmmakers, techies, physical therapists, fitness gurus, entrepreneurs, and more. We learned so much from each and every person we featured here on Wheel:Life and hope you enjoyed their stories as much as we did. Here are a few of our favorites from 2018 and the lessons we learned from them that we’ll strive to adhere to in 2019. Filmmaker Ben Duffy and actor Ajani “AJ” Murray met while working on a project for Yoocan, an online community for people with disabilities. At the time, the actor living with cerebral palsy struck up a conversation with Duffy about his dating struggles and the lack of information surrounding love and sexuality in the disability community. Murray encouraged Duffy to tackle the subject for his next film, and after some initial research, the filmmaker did just that. Duffy and his crew interviewed several members of the disability community who agreed to expose their personal lives on camera, and on Valentine’s Day 2018, the trailer of Take a look at this heart was released. While the full documentary is not yet available to the general public, it has been screened at a handful of colleges and is now available for pre-order on iTunes. Lesson to carry into 2019: Everybody deserves to love and be loved. When aerial yoga came onto Sara Schaffer’s radar a few years ago, her personal experience with it as a student paired with her career in physical therapy sparked an idea: adaptive aerial yoga. Working with Harmony Hoefner, creator of Volo aerial yoga, they developed an innovative approach that allows wheelchair users to move their bodies in various ways with the help of a silk hanging from the ceiling. Participants have reported numerous benefits including decompression of the spine, a release of upper body stiffness, ease of breath, and reduction of chronic pain. If you’re near Lakewood, Colorado, Schaffer holds one-on-one adaptive aerial yoga classes at the Chanda Center for Health. Email frontdesk@chandacenter.org to schedule a session! Lesson to carry into 2019: Movement does the body good! A little over a decade ago, a group of guys with a passion for the outdoors realized people with disabilities had few opportunities to rock climb. Having seen the impact the sport had on a friend with a spinal cord injury, they decided to put on an adaptive climbing clinic in 2007 in an effort to share their knowledge with a larger audience. Over a decade later, what is now Paradox Sports has conducted hundreds of clinics and trips welcoming thousands of participants with disabilities into the rock climbing community. In February 2017, Wheel:Life and Comfort Medical sponsored the Ouray ice climbing trip. Mike Neustedter, executive director of Paradox Sports, chatted with Wheel:Life about the non-profit and how they are bringing adaptive climbing to gyms and mountains across North America. 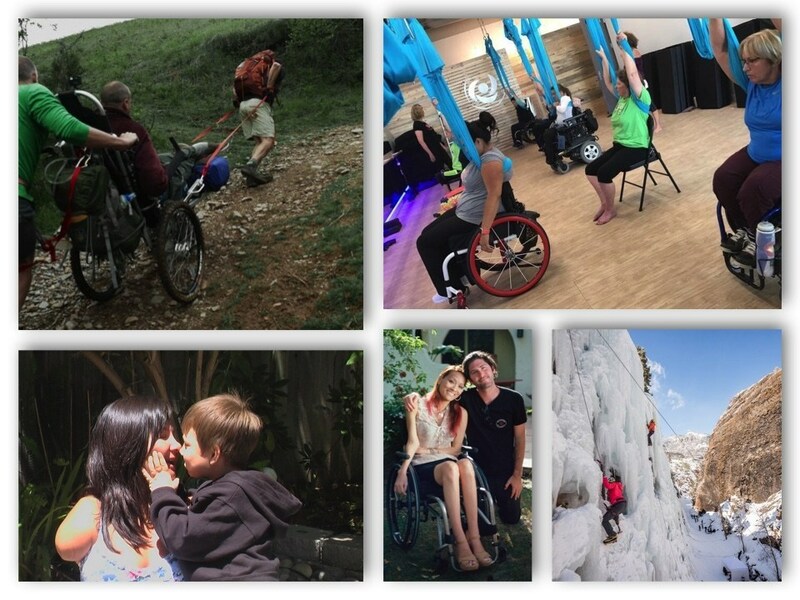 Ask your local gym about adaptive climbing in 2019! Lesson to carry into 2019: Everyone could use a little adventure in their lives! While Pauline Victoria’s parents were preparing for their first child to arrive, prenatal visits showed no signs of abnormality. So when doctors discovered the infant had no arms and only one partially formed leg upon birth, it was a surprise to all. As was typically the case at the time, the hospital advised her parents to leave her at an institution for children with disabilities and move on with their lives without her. But for her parents, that was never an option. A combination of nurture and tough love molded Victoria into the successful woman she is today having worked in an assortment of industries and recently launching her own media network for the disability community, One Leg Up Productions. Lesson to carry into 2019: Don’t wait for the world to change for you. Go out and create the changes you want to see! What was simply meant to be two best friends hiking El Camino de Santiago together, as literally millions have done before them, turned out to be so much more than either of them could have ever imagined or expected. In the documentary I’ll Push You, we follow the two men, as one pushes the other in his wheelchair, throughout their journey from the moment the idea for the 500-mile trek across Northern Spain is conceived to reuniting with their wives upon completion of the pilgrimage — and all the muddy ups, rocky downs, and even paved straightaways in between. Wheel:Life wishes all of our readers a happy, healthy, adventurous 2019. Stay with us throughout the new year for more stories from people breaking down barriers, defying stereotypes, and working toward a better world for all!